• The number of uninsured families continues to persist; accident insurance can cover a portion of their medical expenses. • Most parent insurance plans contain deductibles, coinsurance and copays; accident insurance can offset these out-of-pocket expenses or bridge gaps in coverage. • Accident insurance offers guaranteed coverage for students with no health questions as a condition for coverage. 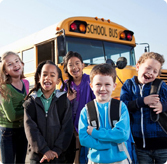 New students who join your school after the effective date are automatically covered or can enroll at any time. • Accident insurance pays benefits per covered accident. This means your students are typically covered for multiple accidents during the policy period. • Accident insurance may reduce your exposure to liability claims and law suits, since medical expenses are taken care of under the accident insurance plan. • Accident insurance can be designed with your budget in mind while providing protection for students 24-hours a day or during school, including school-related activities such as sports and other extracurricular activities. • Accident insurance provides unrestricted choice, parents can be treated by a hospital or physician of their choice. Accident insurance also does not require pre-authorization or referrals for medical treatment. • Claim administration is done in-house, there is no outsourcing. Our dedicated in-house staff can provide the best possible claim service and answer all your questions.